Known informally as the “Sufi Frida Kahlo”, Maïmouna Guerresi is an Italian artist who is most known for her blending of different mediums, primarily sculpture video, installation pieces and photography. Originally born in Italy, Mr. Guerresi converted to Islam after an inspirational trip to Senegal in the early 1990s, joining the Murid community there. It was her conversion and newly-formed identity that played a major role in inspiring her to be an artist. Particular themes she has cited include the relationship between women and society, as well as taking a closer look at shared humanity across cultures and identities. She has also cited the European Body Art movement as a former muse. 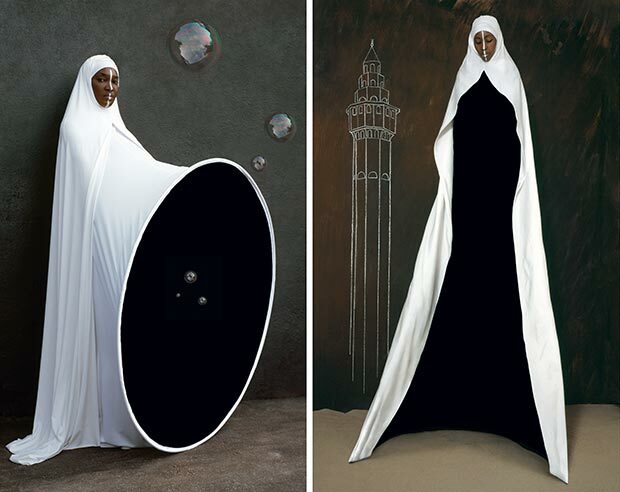 Commonly placed in her work are trees, the hijab and milk, as well as an emphasis on contrast and depiction of the body as “no longer a prison of the soul, but… a temple to house and augment the Divine”. Metaphors abound, she strives to make profound statements about humanity and spirituality. Her work has been exhibited all over the world, most recently at the Italian Cultural Center in India in October 2012 and in the International Museum of Women’s online Muslima exhibition in mid-2013. She is currently exhibiting works from her “Concava” series at the Museum of Modern and Contemporary Art in Rimini, Italy until December 1st. For more information on Ms. Guerressi’s work, please visit her website by clicking here. For more information on the Museum of Modern and Contemporary Art in Rimini, Italy, please click here.